Get the latest version of MagMap2000 from our website. Then go to the www.intermagnet.org website. Click on English, click on Data, click on digital data, click on your general location and then click on the most local observatory site. For instance in Bulgaria, go to Europe then get the PAG for Panagjurishte Bulgaria *vmin.min.zip file and download the data for the survey days in question. Unzip the data. Do not use or download PAG file. We do not support it. 1. 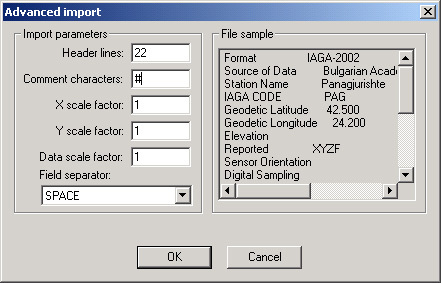 Open it as SURFER file in MagMap2000. Please make sure ALL fields match this example. Press "OK" to load the data. so you base station time matches your 858 time. Bias is added to the base station time. case you need to manually join two base station files into one. - you stop base station, close its file and start new base station file. - you stop your survey. Repeat as many times as you need. All data could be loaded at once. Inspect the data and perform appropriate corrections and Export to create the dirunally corrected dataset. 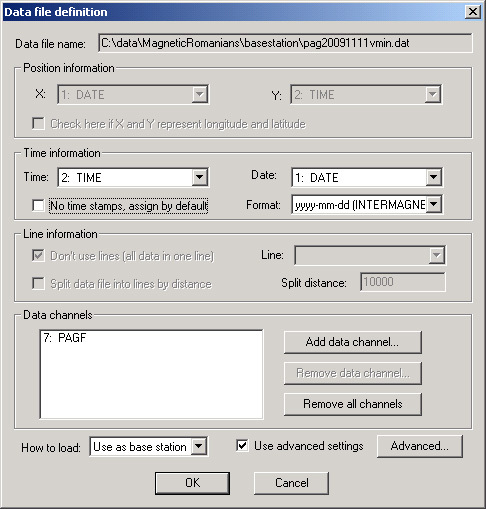 Post Comment for "How to use regional magnetic observatory base station data to do diurnal correction of survey data"